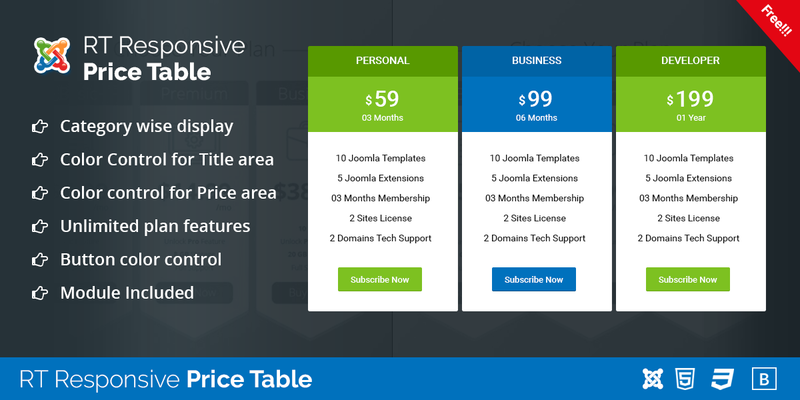 Responsive Price Table Component & Module for Joomla 3.6+. It is fully responsive & mobile friendly for all kinds on device. It has module included. You can display by category wise. You can control Plan Title color, Background, Price color and background & Button color & background. Also can add unlimited plan features. Full Responsive and Mobile Friendly. Plan Title Color and Background Control. Price area price and Background Control. Button Text and Background Control. Link Type control New Page/ Same Page. © Copyright RadiusTheme 2015 - 2019. All Right Reserved.